Scientists widely accept the existence of quarks, the fundamental particles that make up protons and neutrons. But information about them is still elusive, since their interaction is so strong that their direct detection is impossible and exploring their properties indirectly often requires extremely expensive particle colliders and collaborations between thousands of researchers. So, quarks remain conceptually foreign and strange like the Cheshire cat in "Alice's Adventures in Wonderland," whose grin is detectable—but not its body. An international group of scientists that includes materials scientist Valerii Vinokur from the U.S. Department of Energy's (DOE) Argonne National Laboratory have developed a new method for exploring these fundamental particles that exploits an analogy between the behavior of quarks in high-energy physics and that of electrons in condensed-matter physics. This discovery will help scientists formulate and conduct experiments that could provide conclusive evidence for quark confinement, asymptotic freedom, and other phenomena, such as whether superinsulators can exist in both two and three dimensions. Vinokur, working with Maria Cristina Diamantini from the University of Perugia in Italy and Carlo Trugenberger from SwissScientific Technologies in Switzerland, devised a theory around a new state of matter called a superinsulator, in which electrons display some of the same properties as quarks. The electrons, they determined, share two important properties that govern quark interactions: confinement and asymptotic freedom. Confinement is the mechanism that binds quarks together into composite particles. Unlike electrically charged particles, quarks cannot be separated from each other. As distance between them increases, their pull only becomes stronger. "This is not our everyday experience," said Vinokur. "When you pull magnets apart, it becomes easier as they're separated, but the opposite is true of quarks. They resist fiercely." Quark interactions are also characterized by asymptotic freedom, where quarks at close distance stop interacting altogether. Once they travel a certain distance away from each other, a nuclear force tugs them back in. In the late 1970s, Nobel laureate Gerard 't Hooft first explained these two newly theorized properties using an analogy. He imagined a state of matter that is the opposite of a superconductor in that it infinitely resists the flow of charge rather than infinitely conducting it. In a "superinsulator," as 't Hooft called this state, pairs of electrons with different spins—Cooper pairs—would bind together in a way that is mathematically identical to quark confinement inside elementary particles. "The distorted electric field in a superinsulator creates a string that binds the couples of Cooper pairs, and the more you stretch them, the more the couple resists to separation," said Vinokur. "This is the mechanism that binds quarks together into protons and neutrons." In 1996, unaware of 't Hooft's analogy, Diamantini and Trugenberger—along with colleague Pascuale Sodano—predicted the existence of superinsulators. However, superinsulators remained theoretical until 2008, when an international collaboration led by Argonne investigators rediscovered them in films of titanium nitride. Using their experimental results, they constructed a theory describing superinsulator behavior that eventually led to their recent discovery, which established a Cooper pair analog to both confinement and the asymptotic freedom of quarks, the way 't Hooft imagined, noted Vinokur. The theory of superinsulators fleshes out a mental model that high-energy physicists can use to think about quarks, and it offers a powerful laboratory for exploring confinement physics using easily accessible materials. "Our work suggests that systems smaller than the typical length of the strings that bind the Cooper pairs behave in an interesting way," said Vinokur. "They move almost freely at this scale because there is not enough room for high-strength forces to develop. This movement is analogous to the free motion of quarks at a small enough scale." Vinokur and co-researchers Diamantini, Trugenberger, and Luca Gammaitoni at the University of Perugia are seeking ways to conclusively differentiate between 2-D and 3-D superinsulators. So far, they have found one—and it has broad significance, challenging conventional notions about how glass forms. To discover how to synthesize a 2-D or 3-D superinsulator, researchers need "a full understanding of what makes one material three-dimensional and another two-dimensional," Vinokur said. Their new work shows that 3-D superinsulators display a critical behavior known as Vogel-Fulcher-Tammann (VFT) when transitioning to a superinsulating state. Superinsulators in 2-D, however, display a different behavior: the Berezinskii-Kosterlitz-Thouless transition. The discovery that VFT is the mechanism behind 3-D superinsulators revealed something surprising: VFT transitions, first described nearly a century ago, are responsible for the formation of glass from a liquid. Glass is not crystalline, like ice—it emerges from an amorphous, random arrangement of atoms that rapidly freeze into a solid. The cause of VFT has remained a mystery since its discovery, but scientists long believed it began with some kind of external disorder. The 3-D superinsulators described in Vinokur's paper challenge this conventional notion and, instead, suggest disorder can evolve from an internal defect in the system. The idea that glasses can be topological—they can alter their intrinsic properties while remaining materially the same—is a new discovery. "This fundamental breakthrough constitutes a significant step in understanding the origin of irreversibility in nature," Vinokur said. 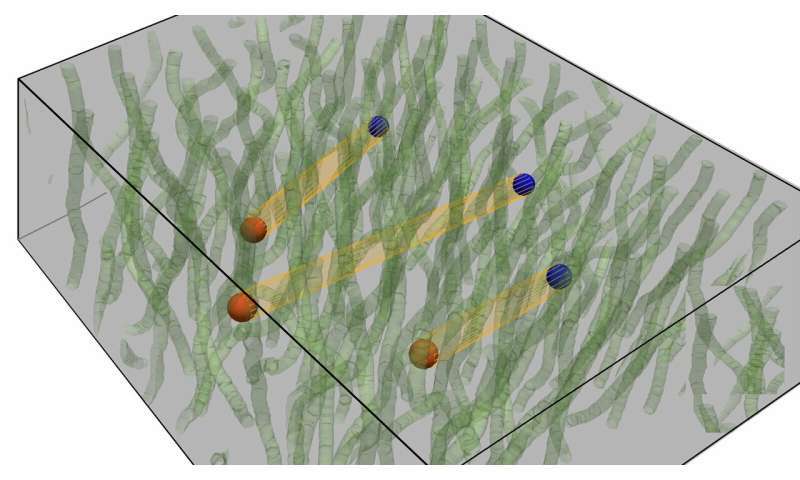 The next step will be to observe this theoretical behavior in 3-D superinsulators. The study brought together researchers from markedly different disciplines. Vinokur is a condensed matter physicist, while Gammaitoni focuses on quantum thermodynamics. Diamantini and Trugenberger are in quantum field theory. "It was most remarkable that we came from very disparate fields of physics," Vinokur said. "Combining our complementary knowledge enabled us to achieve these breakthroughs." Results from the Cooper pairs study appear in the paper "Confinement and asymptotic freedom with Cooper pairs," published on Nov. 7, 2018 in Communications Physics. Work on 3-D superinsulator mechanisms is outlined in the paper "Vogel-Fulcher-Tamman criticality of 3-D superinsulators," published in Scientific Reports on October 24, 2018.